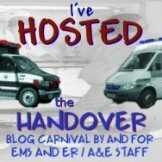 Thanks to some tinkering with basic html, and Happy Medic tinkering with some graphics, I now have a snazzy widget to dish out to all who have, and who will in the future, host ‘The Handover’. You can see it over to the right there, and clicking on it will take the reader to ‘The Handover’ home page, so they can read old editions, see where it is going next, submit posts or even offer to host an edition. I will be emailing the code to all who have hosted so far, but it is completely up to you if you want to display it on your blog or not. Thanks to HM for the assistance and putting up with my demands, and thanks to Kim at Emergiblog for hatching the idea in my brain! « A Change of Job? ?